1. Preheat the oven to Gas mark 4-5, 180-190oC, 350-375oF. 2. 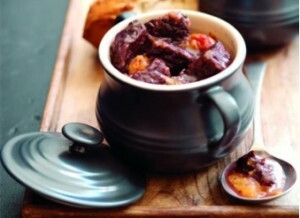 Mix the damson or red wine and the damson jam and pour over the vegetables, season, bring to the boil. 3. Transfer to an ovenproof casserole dish and cook for 1 1/2 hours until the meat is tender. 30 minutes before end of cooking time stir in the damsons or plums. Remove star anise before serving. 4. Serve with rustic brown bread to mop up the lovely juices and a bowl of seasonal vegetables.